WP Opt-In Countdown Plugin is the take action tool you need to create that awesome draw in the face of top niche traffic. We all know that some people need a little bit of a nudge to buy things. That’s just a given. This simple to install easy access software application for your fantabulous WP website is going to set you up with everything you need to DRIVE all that specialty quality traffic to your site with professional and alive countdown to directly collect the data you need to create quality lead lists FAST. With these lists you have the means of tapping straight into your top niche social media marketing medley and that’s going to set you up to connect and thrive for a LONG time to come. The great news for you is this software app is so easy to get started with and powerful beyond words. If you want to step it up a few notches and really start building your online presence this is the perfect tool to start. 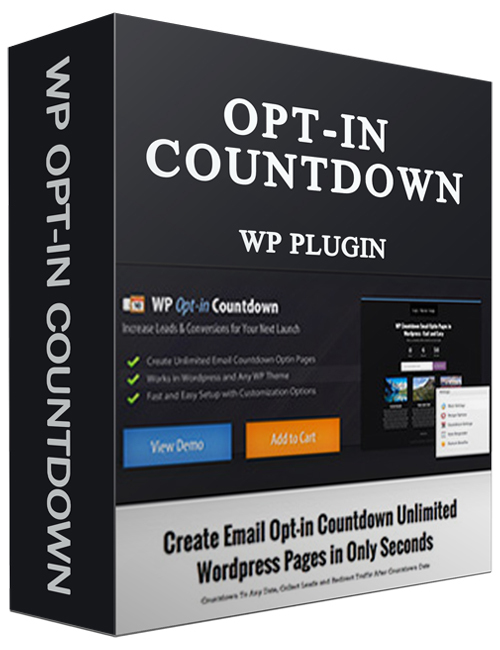 WP Opt-In Countdown Plugin is the BEST move for you today. Get it and WIN!